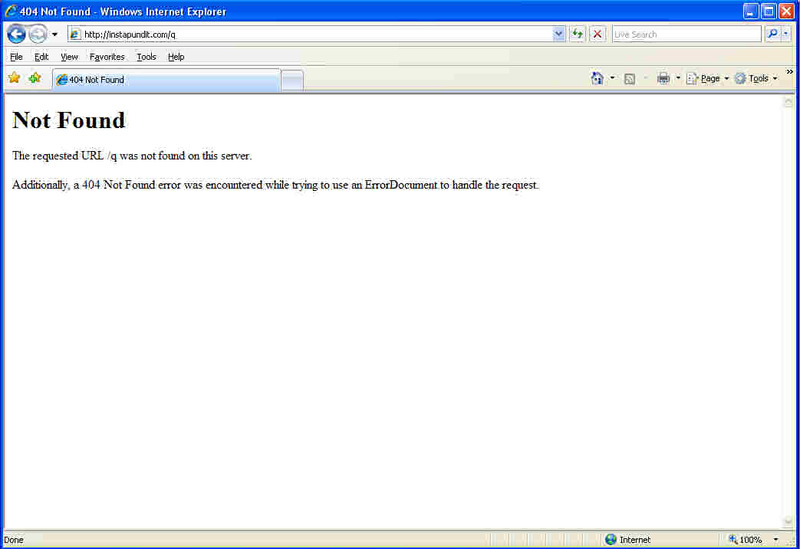 When your Web site cannot find a page, it often displays a special custom 404 message configured on your server. What happens if the site cannot find it? Dude, that’s like a 404 message for a 404 message. In this case, it looks like it’s gotten left behind since the Web site URL without the non-existent page name redirects, and the redirected Web site with the non-existent page name is handled. However, it looks as though with all of the redirection going on, some misdirection has occurred. You do keep track, QA professional, of all of the URLs and all of the landing directories and all of the page names to make sure that they’re handled when the site changes in such a fashion to render them incorrect, right? Right? My wife is in charge of online donations for a large international relief agency, and she recently received a strongly worded e-mail from the leader of a pro-Israeli group accusing her organization of anti-Semitism and anti-Zionism, and threatening to spread the word among potential Jewish contributors–not a good thing. I’ll spare you the rant, but the upshot was that we learned that the “country” drop-down menu on one of her organization’s donations pages omits Israel as a country and includes “Palestine.” Among other things, this means that Israelis can’t donate to the organization from these pages. This isn’t the case on the agency’s own site, but it was the case on the pages for Causes, which puts widgets on social networks like Facebook and MySpace that let members donate to their favorite charities (including my wife’s). When I got a hold of Sean Parker and Joe Green (the co-founders of Project Agape, which created Causes), they tried to fob me off with a “Thanks, we’ll look into this” response. Not what I was looking for. I pointed out that this isn’t just any omission and addition. When you omit Israel and add Palestine (which is not even recognized as a country by the United Nations) to a country drop-down menu, you seem to be making a very loaded political statement. Never trust software (or libraries, or sample code, or snippets, or whatever) that you get from somewhere else. Always vet it as you would your own code. Be aware of political situations, particularly country names that can change through government change, declarations of independence, or whatnot, and know what message your software sends when you omit some or include some. Back in 2005, Electronic Arts sent out an update for its popular video game Madden 2006. The update included updated roster positions as well as a special “feature”: a lineman who was 7 inches tall. You are currently browsing the archives for the Classic Blunders category.